In the recent documentary MARWENCOL we meet Mark Hogancamp, a man trying to cope with the mental and emotional problems (including amnesia) brought on by a severe beating. He does so by creating a village out of dolls and carefully detailed models that he places in a World War II setting. 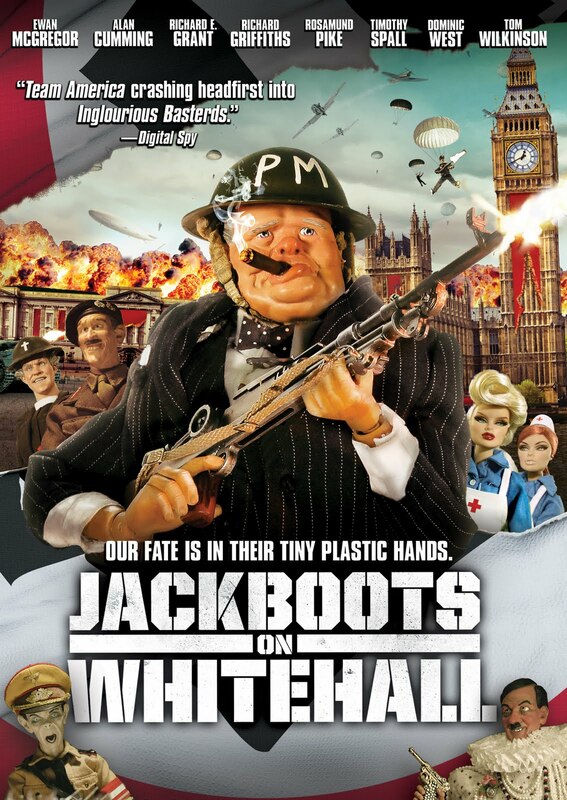 JACKBOOTS ON WHITEHALL looks a lot like Hogancamp's imaginary town come to life. The film is set in an alternate version of World War II where the Nazis take over London. 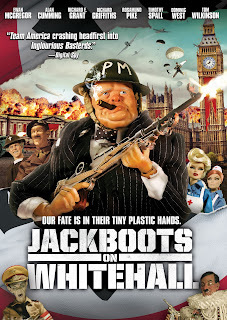 The flesh and blood cast, which is a veritable who's who of British actors, lend their voices only; the on-screen action is brought to life using animated action figures. I doubt there was any direct influence, but the visual similarities are strong enough that you can't help but compare if you're familiar with Hogancamp's unusual vision. Surface similarities are all there is, though. Co-writers/directors Edward and Rory McHenry aren't trying to work through any deep rooted psychological issues; they're going for laughs. The Germans are the target for much of the humor (let's face it, it will always be politically correct to make fun of Nazis), but the film isn't above stereotyping Indians, Scots, Americans, and plain old “stiff upper lip” Brits as well. The plot centers on Chris (Ewan McGregor), an orphaned farm boy who can't join the British military because his hands are too big. He's in love with Daisy (Rosamund Pike), but her father the Vicar (Richard E. Grant) doesn't approve. 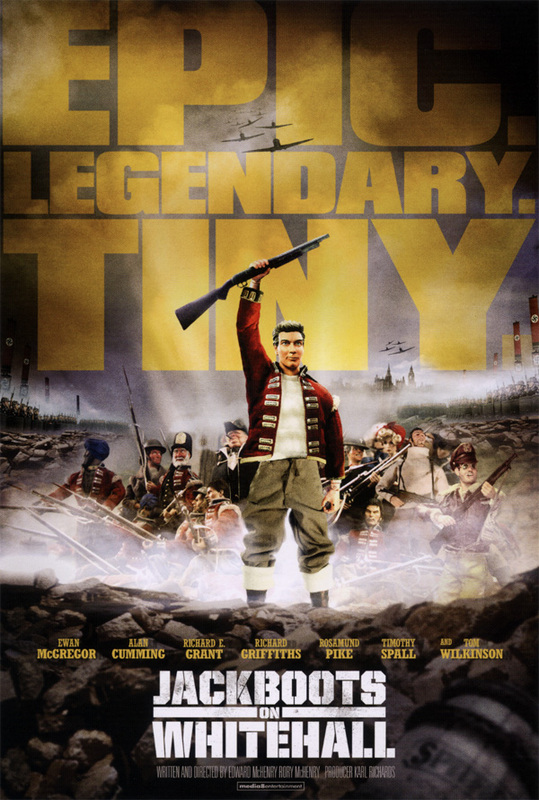 Eventually Chris winds up leading a rag-tag band of townspeople into London to rescue Winston Churchill (Timothy Spall) from the Nazis led by Goebbells (Tom Wilkinson), Goring (Richard Griffiths) and Himmler (Richard O'Brien). Hitler (Alan Cummings) wears a dress, and Braveheart (Cummings again) and a band of Indian soldiers led by Major Rupee (Sanjeev Bhaskar) provide support for Chris' band of freedom fighters. The movie looks great, and I truly admire the sort of hand-crafted artistry that went into making it this way. The problem is, it's not very funny. I don't know, maybe something got lost in the translation. Yes, I know the film is in English, but I'm the kind of guy who needs subtitles when watching a Guy Ritchie movie. Anyway, bottom line is I didn't laugh much. 2 out of 4 stars.